So did you catch that royal wedding? No, not Steve "The King of Las Vegas" Wynn getting hitched, but the actual royals: the Duke and Duchess of Cambridge, a.k.a. William and Kate. It is estimated that over 2 billion people viewed the ceremony worldwide. Think about that for a moment. There are more or less 6.7 billion people on the planet. If you figure a third of them are probably too poor to own a television (and have better things to worry about), and another third were at one time or another colonized by the British (and therefore predisposed not care about the goings on of the royals), that means pretty much everyone else tuned in. I had about 30 people at my wedding, and if you throw out family and people actually in the wedding party, they'd all fit in my living room. I cannot even imagine having to recite those vows with that many people hanging on your every word. Let alone having to wear that crazy bright red uniform Price William had on. I thought the redcoats went out of style after the War of 1812. Maybe he didn't get the memo? Anyway when it comes to weddings, the British royalty knows how to put on a great show. It has been estimated that 20 million pounds (that's $33.4 million U.S. dollars) was spent on the wedding, with a cool $800,000 going towards flowers alone. Are you kidding me?! We did a 2-hour open bar at our reception, and it nearly put us in the poor house. Although, I think the royal affair was probably a bit on the dry side, if you catch my drift. Hey did you notice the diamond tiara the bride was wearing? Word has it that it was on loan from the Queen Mother herself, a gift she received from her father when she turned 18 in 1944. It was the "borrowed" part of the "something old, something new, something borrowed, something blue," British tradition. But did you know that there is a lesser known final line to that little poem? Yeah, it says, "and a silver sixpence in her shoe," and is said to have ensured wealth and prosperity for the newlywed couple. Something tells me these two are going to be just fine in that department. My timeshare rental at The Sloane Gardens Club in the Chelsea section of London actually put me very near the parade route taken by the royal couple. In fact, I am in easy walking distance to Buckingham Palace where it is said that the newlyweds are still holed up after their big day. You'd think they'd head off to some exotic location and live it up like the future king and queen that they are. But word has it that he is returning to work tomorrow as search and rescue helicopter pilot in the RAF. I, on the other hand, am going to enjoy my stay at this fully restored Victorian townhouse in the heart of this very fashionable neighborhood. The shopping, restaurants, and nightlife on the King's Road alone could probably keep me busy for the rest of the week, when I am not enjoying the onsite pool, health club, and casino. Well, I am off to take the tubes (subway) to the Whitechapel section of town for the nightly Jack The Ripper Walking Tour. Each night at 7:30 PM a guided walk takes tourists along the Ripper's slashing grounds. 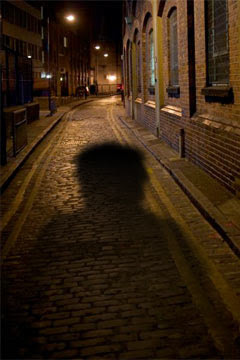 Check out this description from their website: "as the night sets in and the long shadows fall, we delve into the crooked, cobbled alleyways of Whitechapel to follow the Ripper's bloodstained trail of terror." Is that creepy or what?! I love to get the bejeezus scared out of me, and there's nothing like a knife wielding maniac to make those little neck hairs stand on end. They even offer to show you photos of the deceased, if you are so inclined. I think I'll pass on that, but I will be examining the crime scenes very carefully, and who knows, maybe I will be the one to finally reveal the identity of the Ripper himself? I've packed my deerstalker hat and pipe just for the occasion. Now all I need is to find a sidekick who is also a surgeon and a crack shot with a pistol.